Portrait of Arcangelo Corelli by Jan Frans van Douven (1656-1727), a Dutch painter in the service of Corelli's patron, the Elector Palatine Johann Wilhelm. The music of Arcangelo Corelli (1653-1713) exerted a qualitative influence on the development of string music that far exceeded its quantitative parameters. In only six volumes of works Corelli set forth models of two kinds of trio sonatas, two kinds of solo sonatas, and two kinds of concerti grossi. 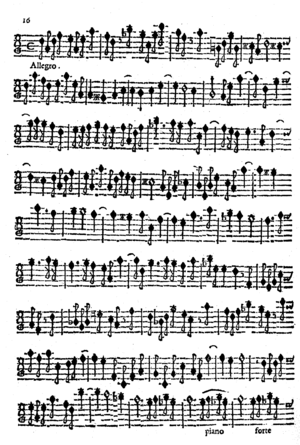 The two kinds were works cast in either (1) the slow-fast-slow-fast pattern of movements long associated with sonatas used within the Catholic liturgy, or (2) the allemande-corrente-sarabande-gigue pattern popular in instrumental suites associated with secular occasions, especially balli to celebrate weddings, investitures, and the rites of passage. These types became known respectively as "church" (da chiesa and "chamber" da camera sonatas or concertos. Born in Fusignano, Corelli developed exceptional skills and an impeccable sense of current taste in his early years. His foundation as a musician was formed primarily in Bologna. He appeared in Rome before the end of the 1670s, but his whereabouts over the next few years are hazy and much disputed. Claims that he visited Paris and the courts of Hanover and Munich cannot be substantiated. The dedicatees of his printed works form a clear guide to his most ardent patrons. Rome, with its wide assortment of churches, cardinals' palaces, and unusual cultural enclaves, such as the court-in-exile of Christina of Sweden, offered much to keep a violinist of Corelli's caliber musically engaged. When viewed in the context of the composer's identified patrons, it becomes clear that Corelli's even-handed attention to both church and chamber mediums represented a conscious effort to satisfy both cardinals and princes. The immense reach of Corelli's music far into the eighteenth century demonstrates its universal appeal. Printed copies of his works from that time are widely spread throughout Europe, North America, and East Asia. This appeal can now be extended through the use of tools to make it instantly playable and viewable in score as well as to visual those features that clarify what the essence of its appeal was and is. Sample of the Violino primo (first violin) part in Corelli's trios sonatas Op. 3, Rome: Gasparo Pietra Santa, 1700. 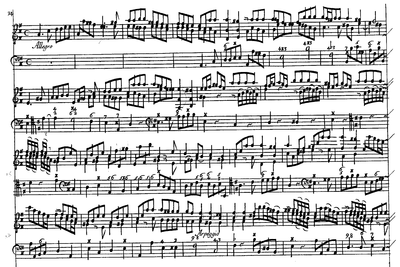 Here we see the second movement (Allegro) from the trio sonata No. 5. The first four of Corelli’s volumes contains “trio” sonatas—sonatas for two violins and basso continuo. In the case of the “church” sonatas (sonate da chiesa; Opp. 1  and 3 ), the works were usually accompanied by organ, which would be reinforced by a cello or a lute or both. In contrast, “chamber” sonatas (sonate da camera, Opp. 2  and 4 ) were accompanied by harpsichord, often reinforced by cello. In church sonatas, imitative writing could occur between treble and bass instruments or between the two violins. Chamber sonatas contained a more variable number of movements, each of which employed the meter of a particular dance type. In addition to the Allemande (a fast movement in duple meter with flowing sixteenth notes), Sarabande (a slow dance in triple meter), Corrente (a “running” or moderately fast dance in triple meter), and Gigue (a fast movement in compound meter, such as 12/8), several other movement types could occur. Although the typologies were inspired by real-world differences of social function, the meanings of the terms, and of the musical prototypes, drifted from these idealized norms to suit special situations and fickle tastes. They necessarily accommodated the styles of individual composers. It was Corelli’s Op. 2 that seems to have established a foothold for the practical use of the term sonata da camera. Had he never composed his solo sonatas or concerti grossi, Corelli’s music would still have left an enormous imprint on European musical culture of his time and the ensuing decades. Up to the end of the seventeenth century, Op. 1 was reprinted 11 times; Op. 2, 12 times; Op. 3, 8 times; and Op. 4, 6 times, in all cases in Italy. Counting eighteenth-century and foreign reprints, the numbers rise to totals of 39, 41, 31, and 39, amounting to a total of 148 printed editions of the sonatas. No other composer of his generation achieved this kind of recognition. These numerous editions pervaded every corner of Europe and the North American colonies. They were models for countless violinists and composers throughout the eighteenth century. Why did Corelli’s trio sonatas have such a broad appeal? For listeners, the works achieved a happy balance between articulate detail and simplicity of melodic line; between imitative interactions between instruments and simple homophony; between clarity of line and subtlety of ornamentation; and between familiar rhythmic templates and momentary deviations from them. Sample page from Corelli Op. 5, No. 6, Allegro. pub. Gasparo Pietra Santa, Rome, 1700. Because of their exquisite balances of features, trio sonatas offered little opportunity for virtuosity, which was also rising to prominence as the seventeenth century ended. We can be sure that accolades of Corelli’s playing were not generated by his contributions to restraint so much as they were by the reputation he gained as a star performer. It is in his famous violin sonatas of Op. 5 that these gifts find their clearest expression. Op. 5 parses cleanly. The first six works are sonate da chiesa of five movements. Most of the movements are fast. Not uncommonly, the first movement is marked Vivace, the fifth a mere Allegro. The second six sonatas are da camera, with Allemandes, Sarabandes, Gavottes, and Gigues predominating after an opening Preludio. No. 7-9 are composed in four movements, Nos. 10 and 11 in five. The final work is a set of vigorous variations over the Folìa bass. Through the opus multi-stop passages marked “arpeggio” occur. In contrast to all the trio sonatas, the violin sonatas of Op. 5 are aimed at players of distinction. They offer great scope for virtuosity and individual interpretation. For this reason, at least fifteen manuscripts survive to document how greatly individual realizations varied and how elaborate performance practice became in the eighteenth century. 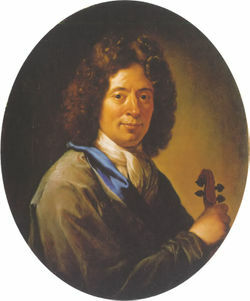 Corelli dedicated the volume on January 1, 1700, and enthusiasts maintain that he wished consciously to address his works to the new century. Corelli Op. 6 Concerti grossi frontispiece. The notated music is from the first page of the first violin part of Op. 6, No. 1. Incision by Francesco Froripani. Publication by Estienne Roger (N. 197), Amsterdam, 1714. In today's repertory, the Corelli's Concerti grossi Op. 6 are regarded as the culminating works of their genre, which had a relatively short shelf-life but which exerted a strong impact on the future direction of ensemble music for strings. Corelli signed the dedication for Op. 6 in Rome on 3 December 1712, five weeks before his death. The two volumes did not appear until 1714. As a genre, the concerto grosso was a logical outgrowth of the trio sonata. The evolution came about in stages. The differentiation of a concertino (group of soloists) from a ripieno had been found abundantly in the early years of the seventeenth century. The difference would be expressed in written notation by clustering like-timbred instruments (as in modern scores). This clarified the on-again, off-again nature of collaboration between the groups. The concerto grosso was both more economical and more articulate. It was economical in extracting all the concertino parts from the ripieno parts. There was no musical independence between the groups. In performance, however, the ripieno sounded fuller not only when it involved more instruments but also because a part for viola(s) was added to the two violins and string bass (or cello). Alternation between soli and tutti became more purposeful, ripieno refrains (ritornelli) became the norm, and the overall structure of the work was architecturally clear rather than, as in earlier decades, somewhat meandering. Beyond the considerations of resulting sonority, Corelli provides some highly elaborated movements in both sections of Op. 6. The first eight works are modeled on the sonata da chiesa, the "church" sonata. They have numerous changes of tempo but few extensive slow movements. Adagio and Largo passages are inclined to be short and transitional. The last four works are modeled on the sonata da camera, the "chamber" sonata. Most employ suite movements such as allemandes, sarabandes, correntes, and gigues. They do not employ the fussy tempo contrasts (allegro, adagio, et al.) of the first eight works. The long-time favorite of Op. 6 has been the Christmas Concerto (No. 8, fatto per la notte di Natale, made for Christmas night.) The 6/8 meter and the drone bass were widely associated with the simple music of shepherds, who carried in from the hills a rustic species of bagpipe (zampogna) that played in parallel thirds over a drone. Very little about Corelli’s music is controversial, but discussions about how exactly it should be accompanied continue. Note the differences in designating bass and basso continuo in the printed collections in the following table (instrument names in parentheses indicate the lack of an independent part). 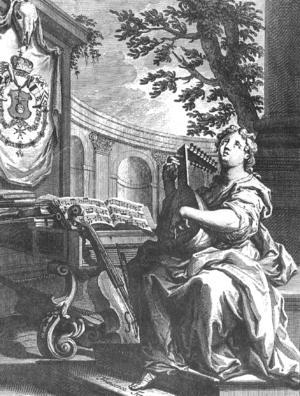 Although substantial liberty was accorded performers in matters of accompaniment, Corelli’s published music shows a clear distinction between two continuo practices: (1) organo with violone (double bass or other bowed string instrument in bass range) or theorbo (archlute), or (2) the choice of violone or harpsichord. This divergence separates the “church” and “chamber” collections substantially. **In the Concerti grossi Op. 6 Corelli provides figured bass parts for both the Violoncello di concertino and for the unspecified Basso del Concerto grosso. As Friedrich Chrysander pointed out more than a century ago, the figuration implies the likelihood that a keyboard (or theorbo) was available to both the concertino and the ripieno groups, even though neither is specifically mentioned in the partbooks. In Corelli's time the choices for Op. 6 would have been influenced by the "church" or "chamber" nature of the specific work. 2010 Commentary by Eleanor Selfridge-Field. Encoding and edition by Edmund Correia, Jr., and Frances Bennion. Rendering by Craig Stuart Sapp and Walter B. Hewlett.